The Lewes jute shopper is is made from sustainable jute material, so not only is it good for your shopping needs but it's good for the environement too. The Lewes is a portrait style shopper, if you're looking for something that has a wider compartment try the York jute shopper. 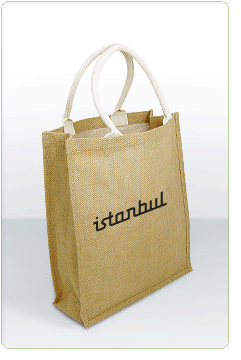 Jute fabric is very hardwaring, making this range of bags a popular choice for grocery shopping. This product comes supplied with deluxe cotton webbing over the rope handle and is lined with a wipeable degradable plastic so it can be used again and again without risk or staining or becoming dirty. It has a large print area on both sides for printing of your brand or business.